My father couldn't really work after the coming of the Nazis in 1933. Quite soon afterwards he was actually prevented from working. They called it Berufsverbot, which means prohibition to exercise your profession, because all the professionals had their various professional association, because the Germans are very thorough, as you know, in those kinds of things. So, he had to be a member of this professional association and after the coming of the Nazis they said Jews cannot be members of the professional association. Not Jews, actually, non-Aryans. We weren't Jews we were non-Aryans which meant, in effect, that we were Jewish enough to be thrown out of Germany by Hitler, but we were not quite Jewish enough to be accepted by the Jewish Relief Organisations in England. So we were in this strange category called Non-Aryan, Nicht Arier because Hitler went back three generations, and there were quite a lot of Jewish roots in my family, but they were all long ago. They all went back to my grandparents and beyond, and we didn't think of ourselves as Jews. We weren't Jews, we weren't, sort of, regular churchgoers, but we went to church, to a Protestant church, Lutheran church, for Easter and Christmas and things like that. We thought of ourselves as Christians, but for Hitler, of course, Jewishness wasn't a religion, it was a race, so you can't get out of that, you know. There's no way out of that. If your grandmother was Jewish, then you were Jewish, that was that; or you were not Aryan, not fully German. Later on when I went to Poland, during my visit to the Polish Film School, I actually discovered some of the details of my family, because my mother was born in Lodz where the film school is situated. And, strange coincidence, a teacher at that film school, one of the professors there, he helped me. He said, if you need some help, I'll come with you. So we went to this archive, this office, and it so turned out that the woman who was in charge, the secretary who was in charge of the archive, actually went to school this man. And they looked at each other and they sort of said, aren't you? yeah, aren't you? you know, whoever. Anyway, because of that coincidence I got hold of details which I photocopied and got with me now, which, without that particular coincidence, it would've taken weeks, no months, it would've taken months to get that sort of information. Because, first of all, you have to prove who you are, if you're entitled to the information, why, and all that kind of nonsense, was bypassed. Anyway, I'm jumping ahead a little bit, but it was very interesting to find out those details, going back to 1840, roughly. The further back you go, the more Jewish we became. People were called Zsigmund and Mojzesz, which is Moses, you know, Mojzesz. My great, great grandfather was called Mojzesz Warszawski. So anyway, my father was prevented from exercising his profession after about 1934 and he did bits and pieces and got on as best he could, but he wasn't able to exercise his actual profession any more. 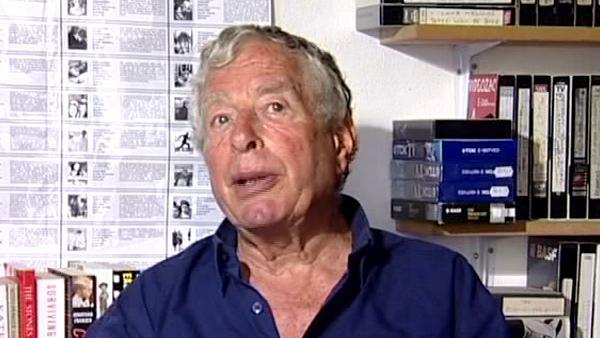 Born in Germany, cinematographer Walter Lassally (1926-2017) was best known for his Oscar-winning work on 'Zorba the Greek'. He was greatly respected in the film industry for his ability to take the best of his work in one area and apply it to another, from mainstream to international art films to documentary. He was associated with the Free Cinema movement in the 1950s, and the British New Wave in the early 1960s. In 1987 he published his autobiography called 'Itinerant Cameraman'. Peter Bowen is a Canadian who came to Europe to study and never got round to heading back home. He did his undergraduate work at Carleton University (in Biology) in Ottawa, and then did graduate work at the University of Western Ontario (in Zoology). After completing his doctorate at Oxford (in the Department of Zoology), followed with a year of postdoc at the University of London, he moved to the University's newly-established Audio-Visual Centre (under the direction of Michael Clarke) where he spent four years in production (of primarily science programs) and began to teach film. In 1974 Bowden became Director of the new Audio-Visual Centre at the University of Warwick, which was then in the process of introducing film studies into the curriculum and where his interest in the academic study of film was promoted and encouraged by scholars such as Victor Perkins, Robin Wood, and Richard Dyer. In 1983, his partner and he moved to Greece, and the following year he began to teach for the University of Maryland (European Division), for which he has taught (and continues to teach) biology and film courses in Crete, Bosnia, and the Middle East.